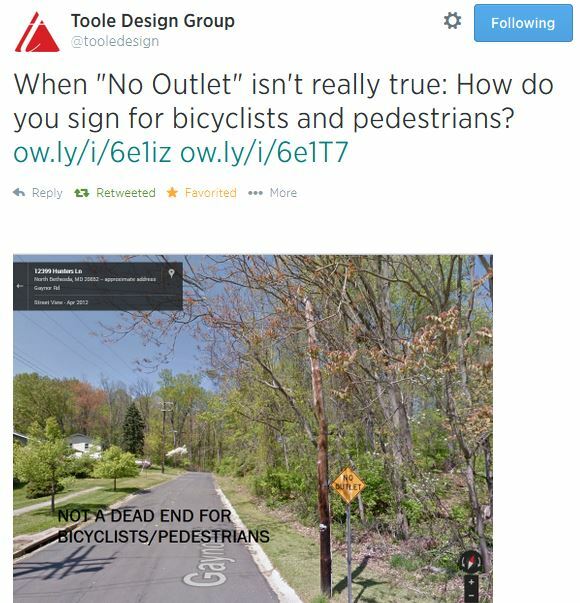 When “No Outlet”, “Dead End” and “Closed” aren’t really true: How do you sign for bicyclists and pedestrians? The Washington, DC region is a great region to explore by bicycle. I biked about 400 miles in July and have talked with several people living in the region that also do not own a car. I met many of these people while biking on the wonderful trail systems and Beach Drive through Rock Creek Park. While we found the trail systems and know that Beach Drive is closed only to motor traffic on the weekends and holidays, the signage to reach the trail systems and the closed portions of Beach Drive do not help to inform more people about the trail systems and the closed portions of Beach Drive. Compared to most transportation projects, fixing the signage is cheap and easy. The impact of this easy fix could be tremendous in reducing congestion on area roads and helping to direct people to where they can improve their health. While I would love to take credit for coming up with the title of this post, Eli Glazier, an intern that sits next to me at Toole Design Group, posted the following to Twitter. Even though there is no outlet for motorists in the above photo, there is an outlet for bicyclists and pedestrians so they can reach Rock Creek Trail, which is 14 miles long. This shows how much people think about motorists and don’t consider bicyclists and pedestrians. I haven’t actually biked on Rock Creek Trail, but the following description, which I found on this site, informs me that the above signage is not the only signage issue with this trail. I like to approach every issue I see with options for how to resolve the issue so I have researched options for how to resolve the above issue. An “Except Bikes and Pedestrians” sign can be placed below the “No Outlet” sign. The below photo, which I found here, shows an example of how this could look. 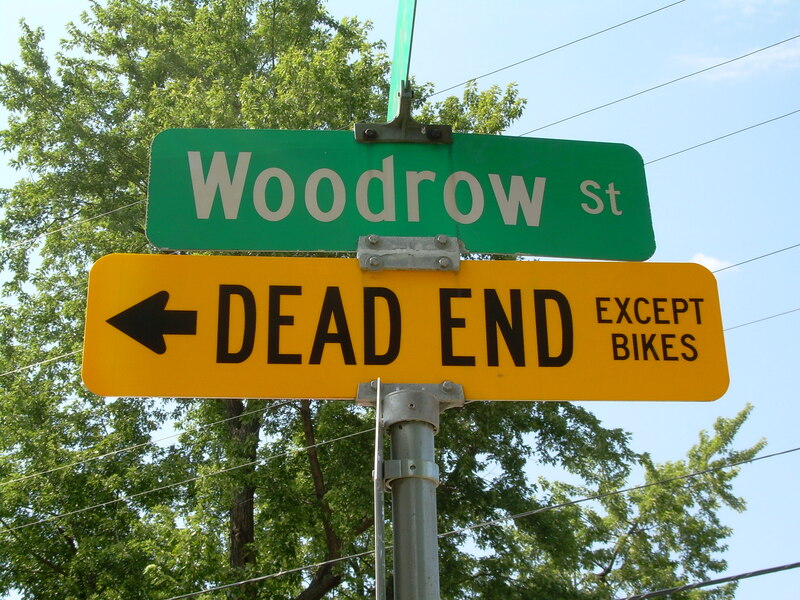 The above sign could be used with the below “Dead End Except Bikes” sign to provide even more clarity. My coworker’s Twitter post helped me to look for the signage issue in other locations. Unfortunately, I found several other locations where the signage is only for motorists and does not consider bicyclists and pedestrians. 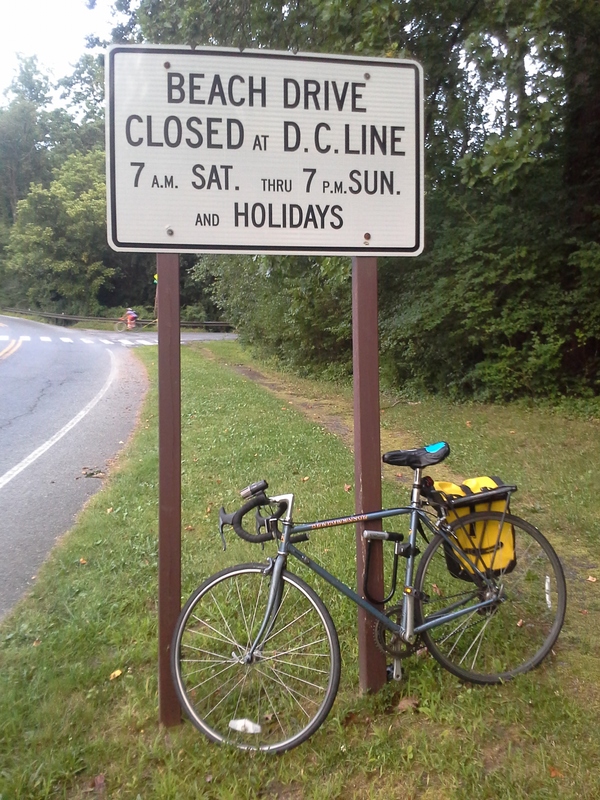 The following photo shows a “No Outlet” sign along the access road to the Sligo Creek Trail, which is 10.6 miles long. The reason why I have been including the length of the trails is because I want to inform people how long these trail networks are. They truly are long trails and a missed opportunity if someone cannot find the trail because of poor signage. 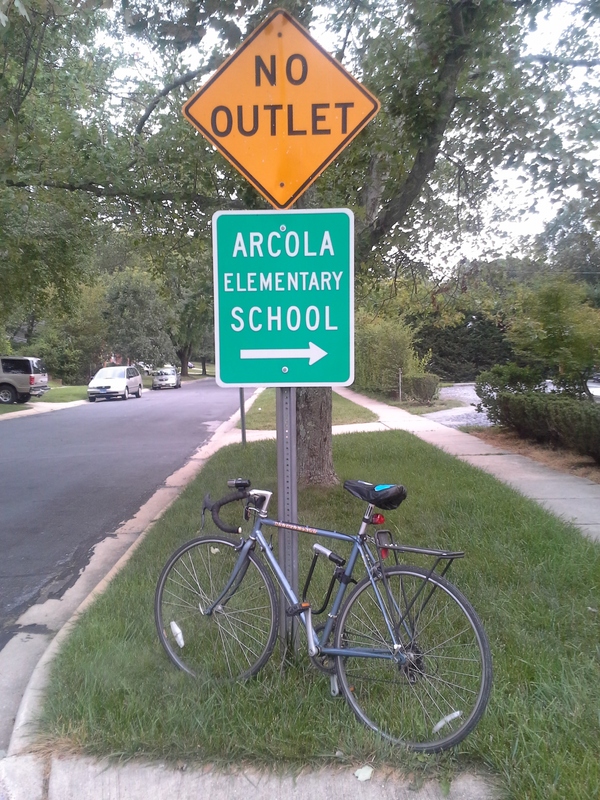 As the below photo shows, the Sligo Creek Trail is near Arcola Elementary School. While I can hope the people who attend and work at this school use the Sligo Creek Trail to travel to and from school, I wouldn’t be surprised if most of them drive an automobile to and from school. If this is the case, I would start a Safe Routes to School program at this school to encourage usage of the Sligo Creek Trail to travel to and from school. I noticed several homes located along the Sligo Creek Trail so there has to be some people who can participate in the Safe Routes to School program at this school. Since every road that ends at the Sligo Creek Trail in this area has “No Outlet” signs, I would not have known which road to proceed down to access the Sligo Creek Trail if I didn’t have a smart phone with Google Maps to direct me to the correct road. Even though most people today have smart phones, what if I didn’t have a smart phone? Would I still have been bale to find the correct road to access the Sligo Creek Trail? Without good signage, people without smart phones can easy get lost trying to find the entrance to the Sligo Creek Trail. While the below signage isn’t as big of an issue, I don’t understand why the signage seems to assume that bicyclists and pedestrians know they are allowed to use the Sligo Creek Trail. 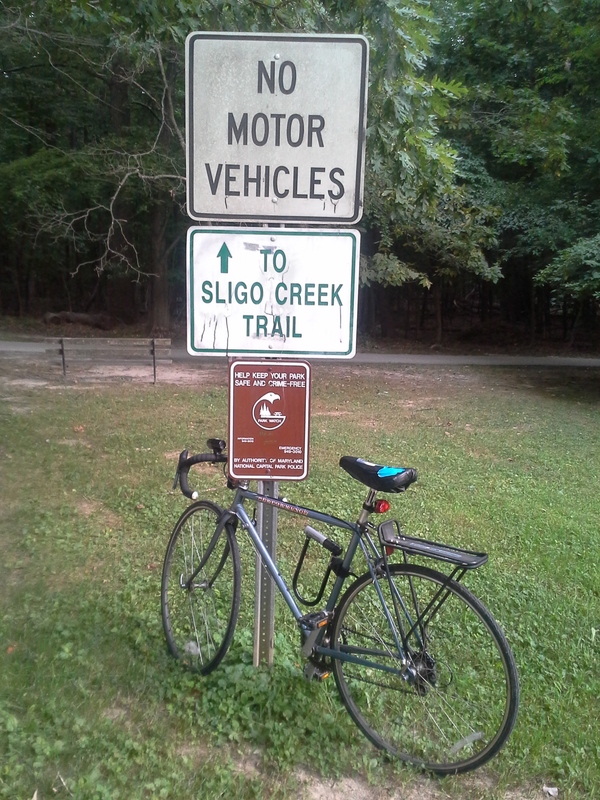 Since I have found some trails that prohibit bicyclists, I would enjoy seeing signage informing me that I can use the Sligo Creek Trail. Signage needs to be used in both cases and not just when a certain mode of transportation cannot use the trail. 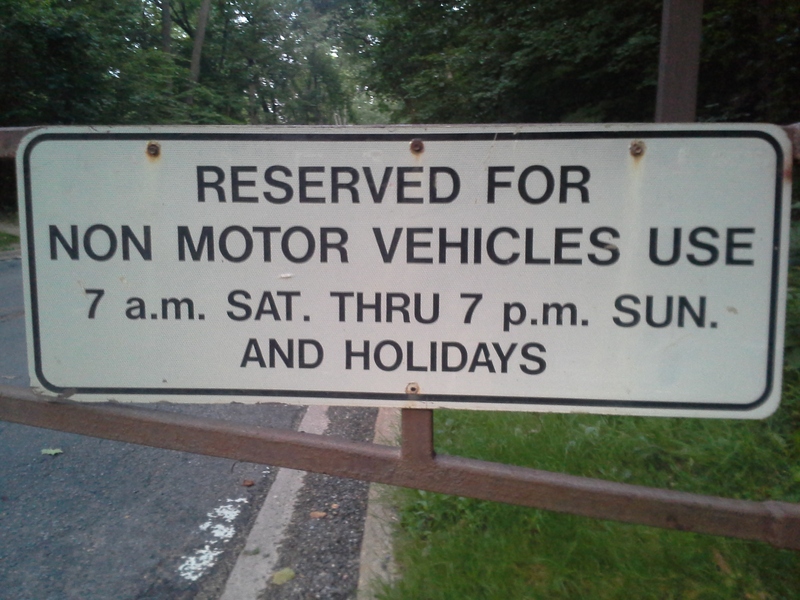 The top sign clearly states that “No Motor Vehicles” are allowed on the Sligo Creek Trail. I don’t see any signage to indicate that the Sligo Creek Trail is open to bicyclists and pedestrians. The following “No Outlet” signs are located on Willow Lane in Chevy Chase, MD. While there is no outlet for motorists, there is a nice path for bicyclists and pedestrians at the end of Willow Lane that connects Willow Lane to Oakridge Avenue and Leland Street. 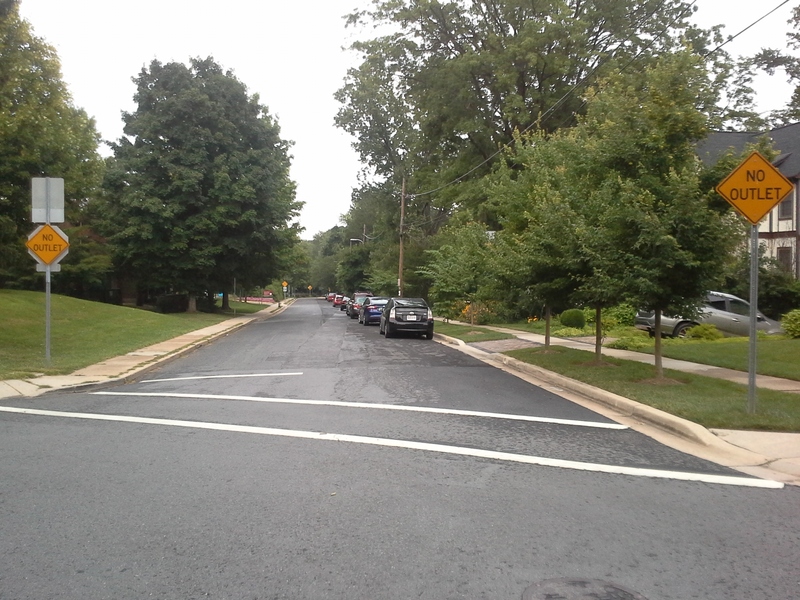 I have used the below path several times as I bike from downtown DC to Silver Spring, MD. 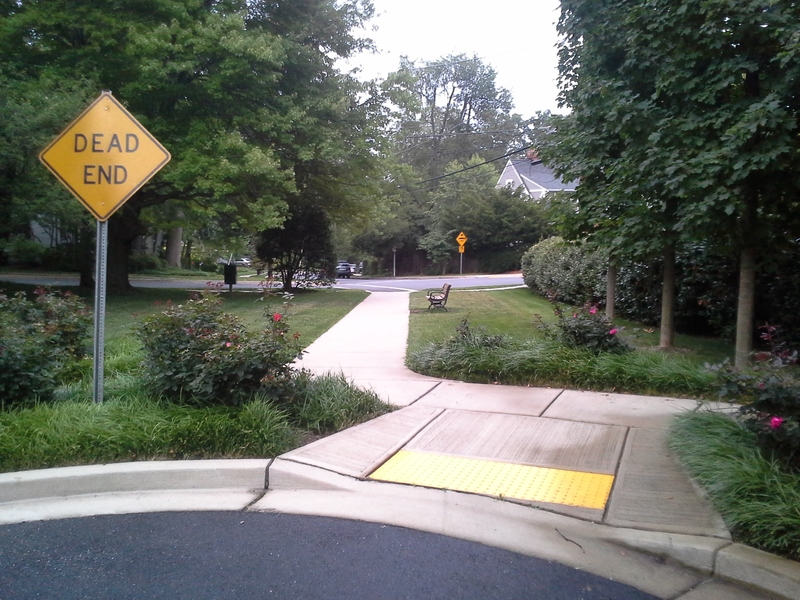 This path provides a nice connection between where the Capital Crescent Trail ends in Bethesda, MD and where I connect to Beach Drive in Chevy Chase, MD. Since this path is shown on Google Maps as a bike path, Google Maps directed me to use this path. What if I didn’t have a smart phone to direct me to use this path? More cyclists and pedestrians may use this path if the above “No Outlet” signs and below “Dead End” sign were corrected with “Except Bikes and Pedestrians” signs. 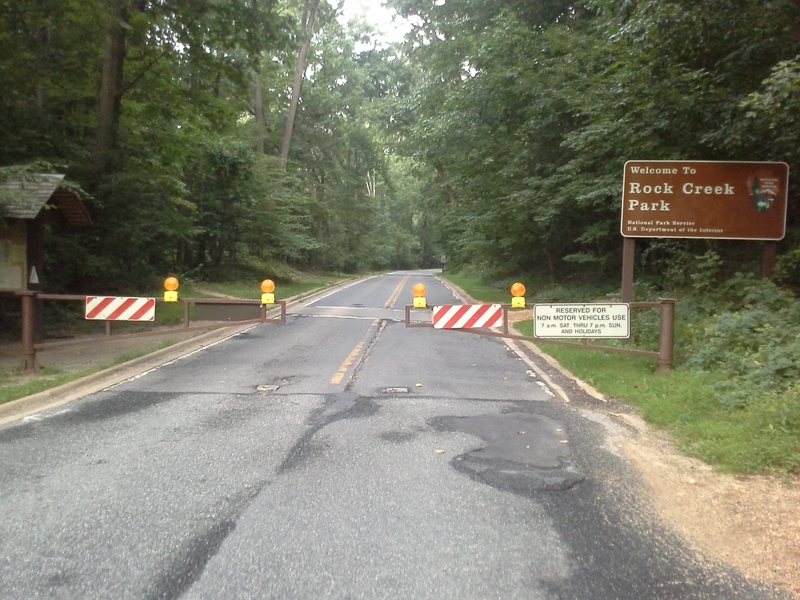 Several sections of Beach Drive are closed to motor vehicles within Rock Creek Park on the weekends and holidays. As the below photo shows, it appears these sections of Beach Drive are closed to all modes of transportation. This isn’t true. Since cyclists and pedestrians can use the closed sections of Beach Drive, an “Except Bikes and Pedestrians” sign should be installed to resolve this confusion. By installing this sign, more cyclists and pedestrians should use the closed sections of Beach Drive. I have been riding on the closed sections of Beach Drive every weekend and it is one of the highlights of my weekend. The below photo shows the opening in one of the closed sections along Beach Drive so bicyclists and pedestrians can access Beach Drive when it is closed to motorists. The below photo shows the white sign better so you should be able to read it. Have you seen “No Outlet”, “Dead End” or “Closed” signs where you live? Does the road end at the entrance to a trail or path that bicyclists or pedestrians can use? If so, do the “No Outlet”, “Dead End” or “Closed” signs include “Except Bikes and Pedestrians” signs? What is Doris Day Parking? Start watching this clip at 0:59 to understand what Doris Day Parking is. 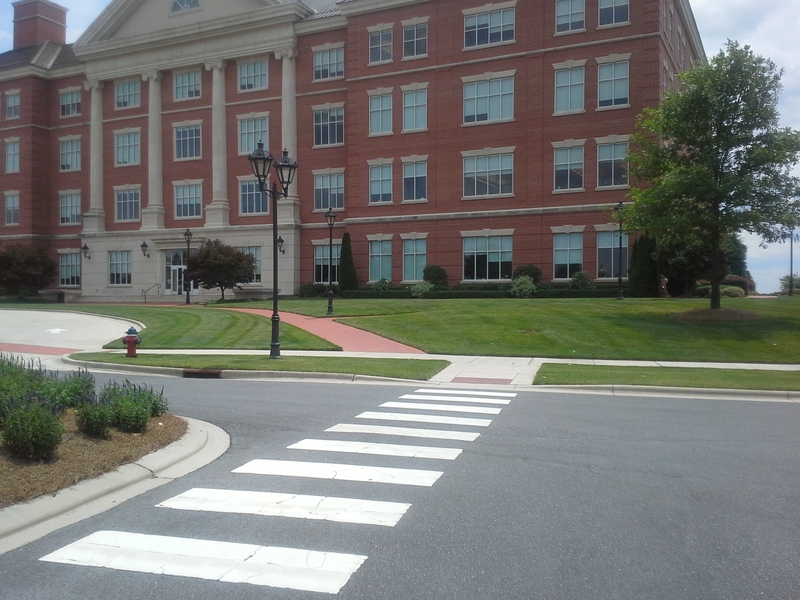 Almost all, if not all, buildings in Kannapolis have Doris Day automobile parking. 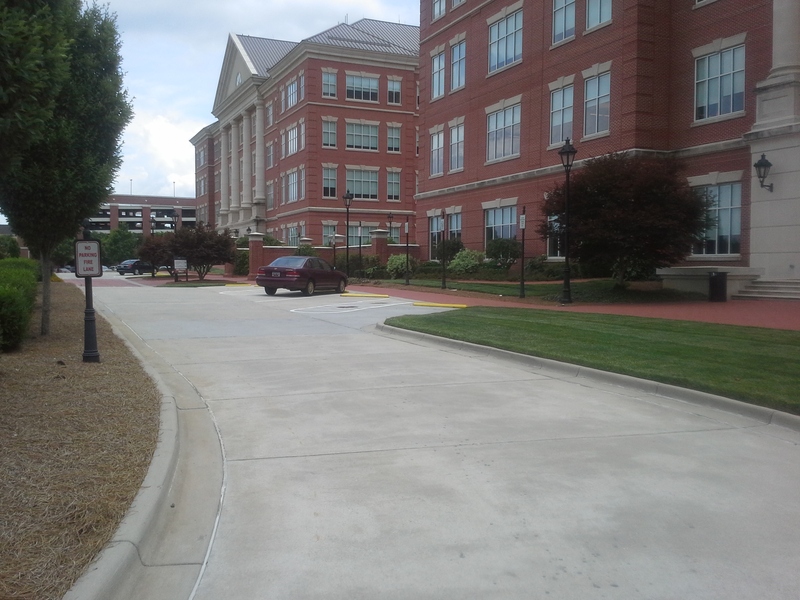 Before I start discussing the automobile and bicycle parking situations on the North Carolina Research Campus (NCRC), I need to mention that the NCRC is not fully built out yet. However, I feel this is not an excuse for the oversupply of automobile parking on the NCRC. 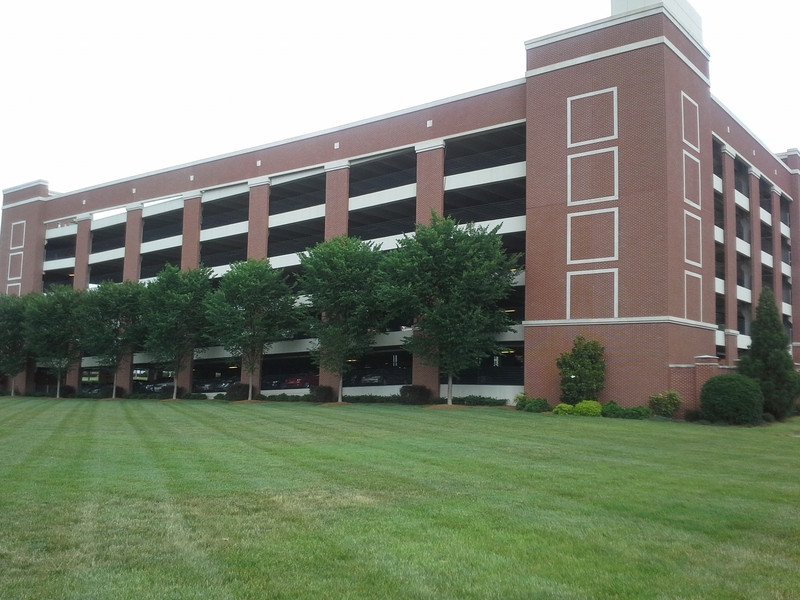 Since there are many Transportation Demand Management (TDM) strategies that the City of Kannapolis and NCRC can pursue instead of adding more automobile parking, I believe there is already too much automobile parking for the fully built out NCRC. While there are TDM strategies being pursued, I believe the strategies aren’t strong enough. This is evident in how there is an oversupply of automobile parking, especially Doris Day automobile parking. Doris Day automobile parking continues to be built for every single building while only a few bike racks are being built. This is only one example of how weak the TDM strategies are in Kannapolis. My goal with writing this post is to discuss the extreme contrast between the oversupply of Doris Day automobile parking and undersupply of safe and convenient bicycle parking at UNC Chapel Hill’s Building on the NCRC. I want to fully disclose that I graduated from UNC Charlotte, which competes with UNC Chapel Hill. The reason for writing this post does not involve this competition so please remember this as you read and comment on this post. As the below photo shows, the motorist was able to park only a few feet from the entrance to the building. Since Kannapolis provides so much Doris Day automobile parking, it encourages driving an automobile for every trip. Here is a closer view of the surface parking area. This is Doris Day Parking because the stairs to the building entrance, which can be seen on the right side of the photo, are only a few feet from the parking spaces so motorists only have to walk a few feet to enter the building. In case you are wondering, it is free to park here. Before the next photo is shown, notice the six story parking deck in the background. Even though there are six stories, only the bottom two floors were partially used when I took the below photo around noon on a work day. Considering the fact that the NCRC isn’t fully built out yet, do you see the potential for all six floors being full someday? I would prefer the NCRC pursue a different route. This route could reduce the likelihood of all six floors being used and prevent having the need to build another parking deck or surface lot on the NCRC. 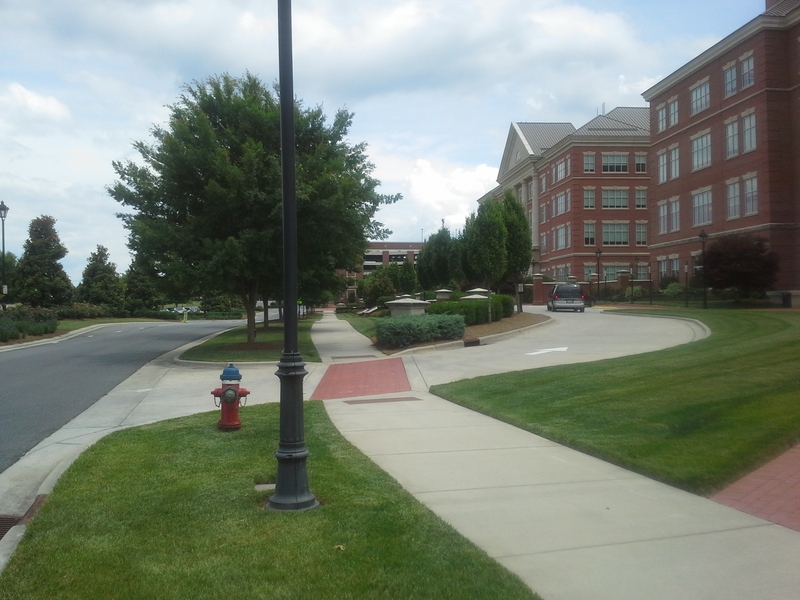 In order to achieve this route, the NCRC and City of Kannapolis would have to implement TDM strategies that encourage use of sustainable modes of transportation instead of encouraging the use of the automobile for every trip. Given the fact that Kannapolis is very dependent on the automobile, do you see the potential for Kannapolis to implement strong enough TDM strategies that would encourage enough people to shift from driving their automobile to using a sustainable mode of transportation? 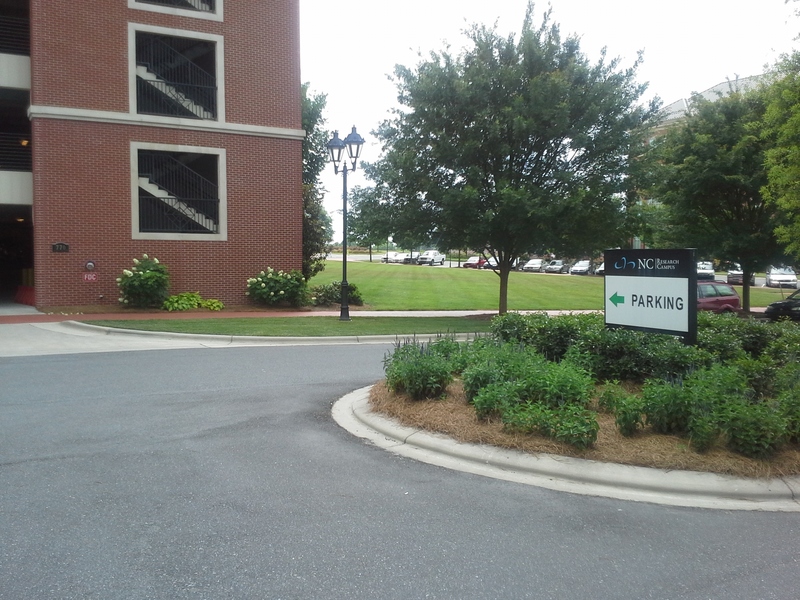 Not only do motorists have a six story parking deck that is barely used, they also have wayfinding signage to direct them to the parking deck. While this wayfinding signage helps to reduce vehicle miles traveled (VMT) because motorists can more quickly find where to park, there is no wayfinding signage to help bicyclists find where to park their bike. 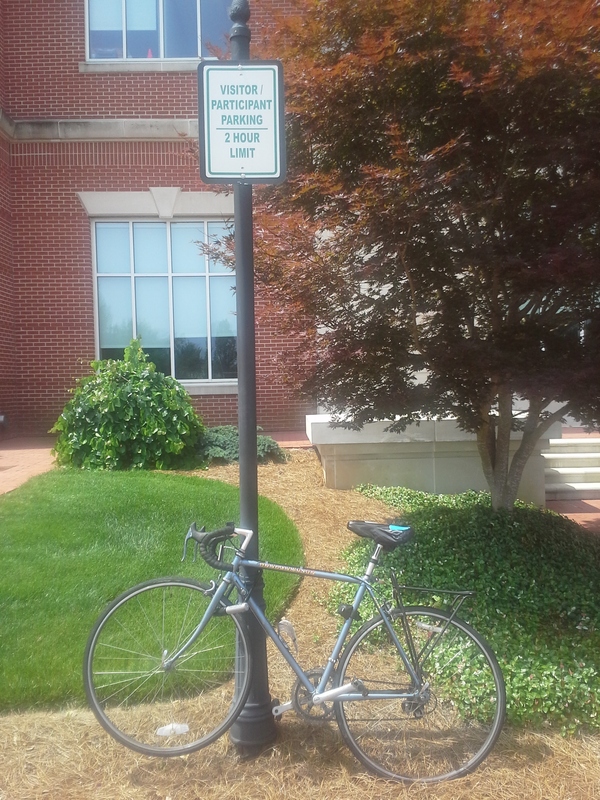 Since I was determined to find where I was supposed to park my bicycle, which I struggled to park illegally to the sign below, I walked around the entire building. I struggled to park my bicycle because I had to lift it high enough for my U-lock to fit around the sign. While holding my bicycle high enough, I also had to maneuver the U-lock through the front wheel and frame. It took me at least a minute to lock my bicycle! To my amazement, there was actually some bicycle parking located on the right side of the building and more located on the rear of the building. However, none of the bicycle parking was Dorris Day Parking like it was for automobile parking. I find it ironic that the UNC Chapel Hill Nutrition Research Institute, which is located inside this building, is researching how to “prevent or treat diseases like obesity, diabetes and cancer.” One simple and inexpensive way to work towards this goal is to install Dorris Day bicycle parking so people can feel encouraged to bike to the building instead of drive an automobile. 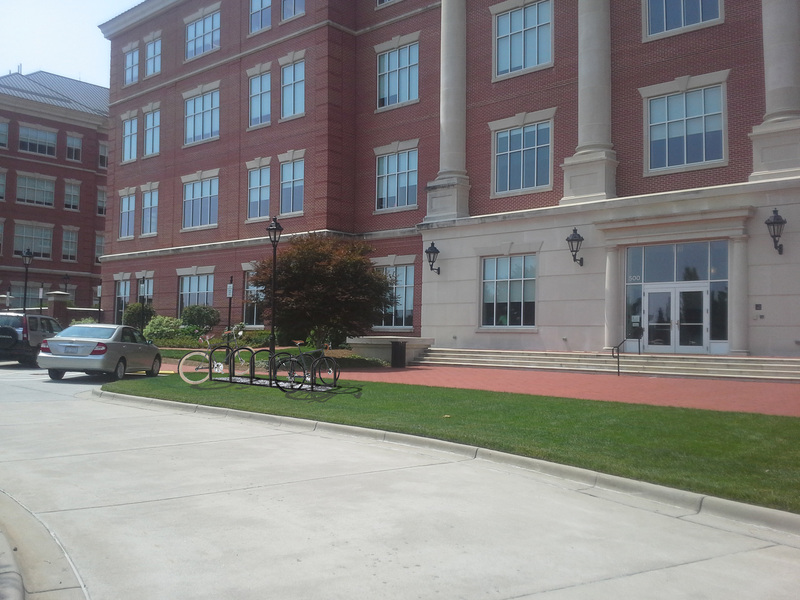 To make matters worse, the bicycle parking that has been provided is the same poorly designed and installed bicycle parking that was installed at Rowan-Cabarrus Community College’s NCRC Building. Even though UNC Chapel Hill and/or the NCRC probably received Leadership in Energy and Environmental Design (LEED) points for installing wheel bender bike racks, I cannot safely use the poorly designed wheel bender bike racks. As the below photo shows, the wheel bender bike rack is poorly designed because the person who owns the bike cannot lock the bike rack with the front wheel and frame using a U-lock. Instead, the person is forced to use a wire lock, which can easily be cut. Unfortunately, the issue goes beyond the infrastructure that is installed. Education is also needed to educate cyclists on how to properly lock their bike. 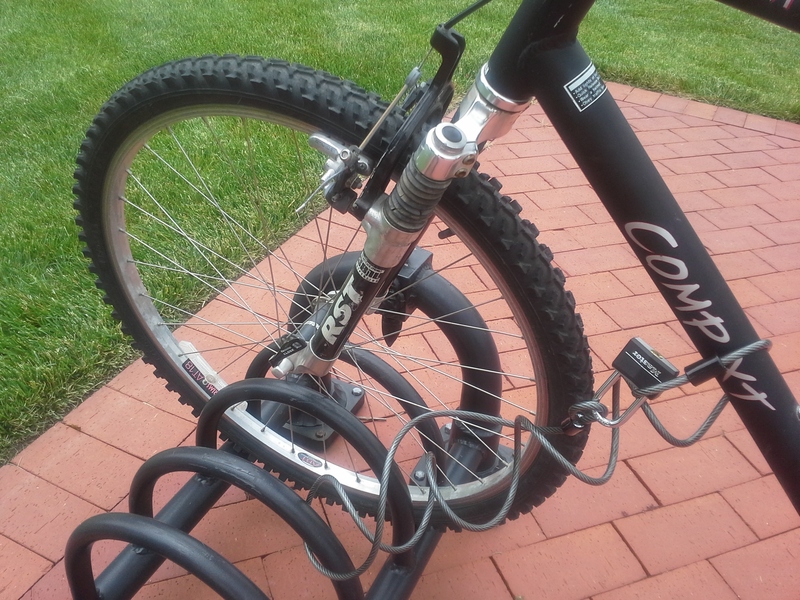 This issue can be seen in how the wire lock in the below photo was only locked to the frame and not to the frame and front wheel. Since the front wheel is quick release, the front wheel can easily be stolen so a U-lock needs to be used to lock the front wheel and frame to the bike rack. 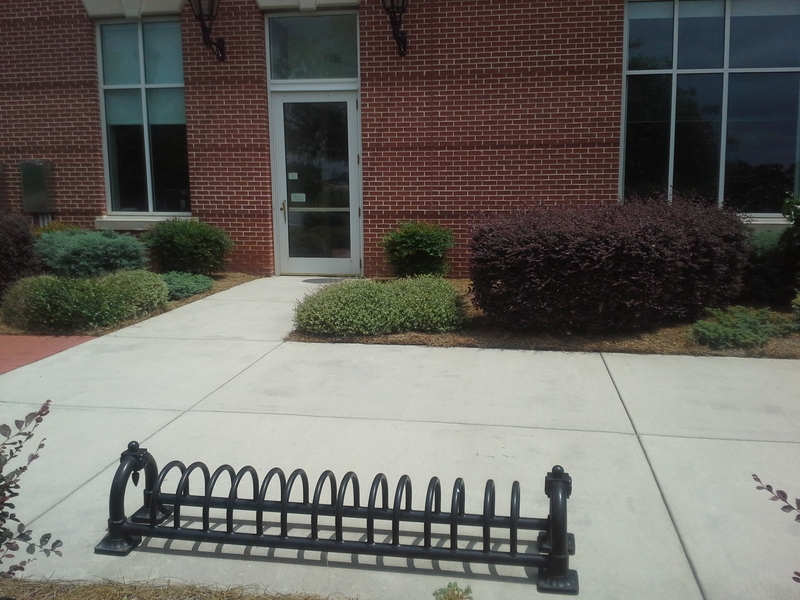 The wheel bender bike racks cannot reach the frame so a safer type of bike rack is needed. In addition, the wheel bender bike racks are poorly installed because the side entrance door to the building is locked so visitors have to walk around to the front of the building to enter. The poorly designed and installed bicycle parking does not promote bicycle use to the building. Since there isn’t correctly designed and installed bicycle parking, I am forced to risk getting a ticket for parking my bicycle illegally. I value the safety of my bike more than using an inferior product. Will UNC Chapel Hill or the NCRC install safe bike racks to replace the wheel bender bike racks? 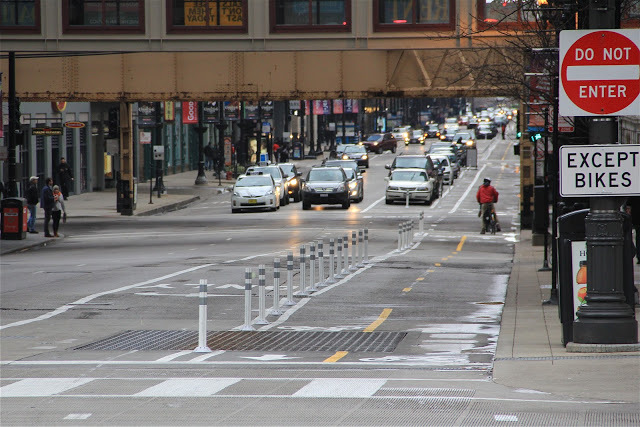 The below photo shows one potential location for inverted U bike racks to be installed. I chose this location because it provides cyclists with convenient access to the front door, which is open for visitors. Through providing people with convenient bike parking, it encourages them to bike to the building instead of drive an automobile. One way to encourage people to bike to the building even more is to provide covered bike racks so bikes aren’t exposed to the elements. I have discussed the extreme contrast between the oversupply of Doris Day automobile parking and undersupply of safe and convenient bicycle parking. Since I move to Silver Spring, MD on June 29, I only have time to write two more blog posts before I leave. My next post should be about my proposed redesign of a difficult bicycle connection between where the proposed buffered bike lanes on Loop Road end and the proposed bike lanes on Mooresville Road end. Following this post, I plan to discuss my expectations of living car-free in Silver Spring, MD and the Washington, DC region. After I arrive in Silver Spring, MD, I plan to discuss whether or not my expectations came true and what challenges and benefits I am experiencing from living car-free in Silver Spring, MD and the Washington, DC region.